• This stylish wine holder centerpiece is a perfect conversation starter for wherever you most enjoy having a glass and measures 4.75" x 3.5" x 7.75"
• Just insert a wine bottle into this wine holder to complete the effect. • Please Note: This wine holder is not intended for children, some edges may be sharp, take care when handling! In addition to Amazon's standard Return Policy, as the manufacturer we offer a full refund or replacement guarantee for 1 (one) full year. If you are ever not satisfied for any reason, please contact us directly. Thank you for choosing Clever Creations. 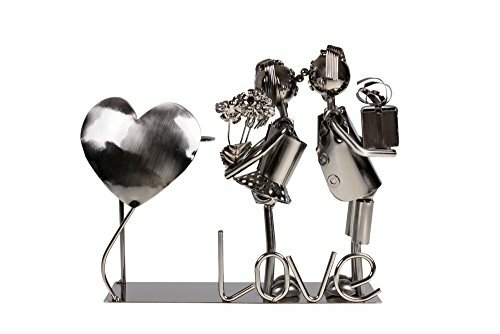 UNIQUE WINE BOTTLE HOLDER: This wine bottle holder features an adorable, loving couple holding kissing and hiding gifts from each other. . The bottle holder features an ornate heart, making it a great gift for holidays and special occasions. STURDY DESIGN: With a wide, stable base, this wine bottle holder is stable and resistant to bumps and spills. This design ensures you won't have to fear the catastrophic spill. If you have any questions about this product by Clever Creations, contact us by completing and submitting the form below. If you are looking for a specif part number, please include it with your message. © 2019 - thisisnoteworthy.com. All Rights Reserved.